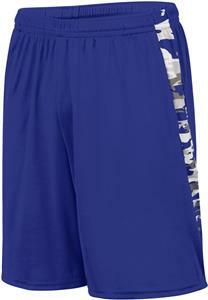 Augusta Sportswear Adult/Youth Mod Camo Training Short. 100% polyester wicking knit with printed Mod Camo inserts. Roller printed inserts to reduce chance of dye migration. Wicks moisture away from the body. Pad print label. 100% polyester wicking knit with printed Mod Camo inserts. Roller printed inserts to reduce chance of dye migration. Waist Relaxed 27" 29" 31" 33" 35" 37"
Waist Relaxed 24.5" 25.5" 26.5"